The deadline for sending abstracts for the 2nd Materials Chain International Conference - MCIC 2018 has been extended until September 28! 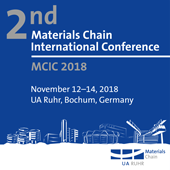 The conference, to be hosted by the UA Ruhr flagship program Materials Chain, will take place from November 12-14, 2018 at Ruhr-Universität Bochum’s Conference Centre, Germany and will highlight recent trends in materials science and technology by giving insight into current research and future prospects in this area. You can register for MCIC 2018 conference and submit an abstract related to the scope of one of the four core research hubs of the Materials Chain here. For further information, please visit the conference website.